(1964 – 1980) off South Devon. The 80 tonne ketch “Tectona” which was built in Calicut India during 1932 and served as a training vessel for cadets of the School of Maritime Studies between 1964 and 1980 has been found in Marseilles. Dr Roger Crabtree a recently retired general practitioner from Bishops Lydeard in Somerset has purchased the vessel. 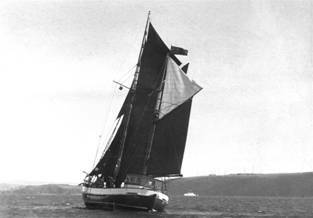 He plans to sail her back to Plymouth during 2008 to be refurbished at Mashfords yard. After completion of refurbishment “Tectona” will be operated as a sail training vessel for disadvantaged young people.